Okay, this is more like it. Bless you, Matt Selman. 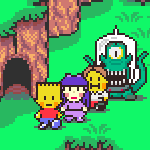 Very old-school-style plot here, with Bart and Lisa teaming up to solve a mystery. Good to see the sibling detectives back in action. 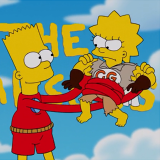 Everything about Homer (and eventually the kids) completely giving up was pretty funny in a bleakly low-key way. I also liked the reveal of the true thief and subsequent NYC-style father-son bonding. The use of actual footage from "Dr. Doolittle" was an odd way to start things off, but post-apocalyptic montages are always a great way to end things. And I think we were all waiting for the day when they'd reveal Bender is still in the basement. Well... it was alright I guess. Have a bit of a hard time getting invested in Homer plots nowadays. Not that it never had a good moment mind you.Did like that the guy set up to be the obvious villain wasn't actually the obvious villain and it was nice to see Bart and Lisa actually teaming up (and Lisa pushing past the "ew, meat" mindset for Homer's sake, found her more likable here than in a good majority of other episodes in the Jean era. Also got a smile out of super-bored Allison at the start. Still bothered me that Nelson was leading the jeering after the movie. Then I went back and looked past the first bit of credits. Well the 'liked it alright' thing... uh scratch that part. Still bothered me that Nelson was leading the jeering after the movie. The Doctor Doolittle part edged dangerously close to feeling Family Guy-ish and lasted too long, but it felt like it's always great to see Bart and Lisa Do Stuff together, Homer's BBQ fascination felt like something he'd be into, and the show's never done competitive grilling as a subject. So it was at least entertaining and felt less weird.